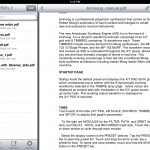 If you spend large chunks of time working with PDFs on your iPad, consider these five tips essential reading. The iPad has been criticized as being mainly a device for content consumption. But as use of the iPad in business settings skyrockets, it’s clear that there are a lot of iPads out there that are taking care of business. Here are five of our essential tips for getting things done on your iPad.